Chichlids (Cichlidae) comprises the largest group of ornamental fish with wide range of varieties. Cichlids belong to the family Cichlidae, sub-order Labrodei under the order Perciformes. This large group of suborder Labrodei share one common trait. The lower pharyngeal bones are fused to form tooth bearing pharyngeal jaws. These 'jaws' are used along with mandibles (true jaws) for processing food. Cichlidae have further evolved to eat diverse types of food. 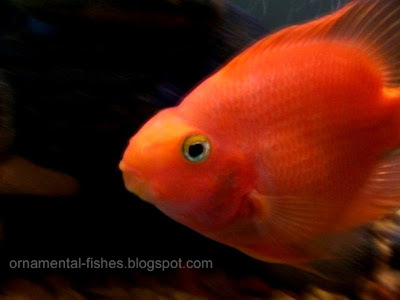 The shape and appearance of the ornamental cichlids has undergone great diversification ranging from compressed disc shape of discus, compressed triangular shape of angelfish to cylindrical and elongated oscars. The following salient features distinguish the cichlids from other Labrodei. In cichlidae there is only a single nostril on each side of the head. In ornamental cichlids the orbit of the eye is devoid of bony shelf underneath it. In the cichlidae the lateral line organ is split into two, seen on the upper half and middle of the flank. In cichlidae the otolith is uniquely shaped. In cichlids the intestine is connected to the left side of the stomach. Cichlids are distributed geographically in Americas, Africa, Madagascar and southern India. There are no native cichlids in the far-east or Australia. In America also these ornamental fish are naturally present only from Texas to Argentina. Ornamental cichlidae have been specific to each region. 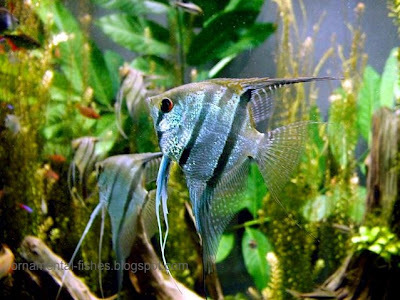 In Americas the popular ornamental fish oscar, discus and freshwater angelfish are found in nature. African lakes have been the home for many diverse ornamental cichlids. 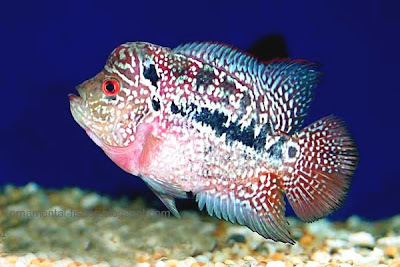 The fish species there are categorised as Malawi types, Tanganyika types, Victoria types and other African cichlids. The native cichlidae habitats vary for each type of ornamental fish right from rivers, lakes, ponds to puddles. Most of the cichlids live in freshwater and a few may tolerate brackish water. Most of the ornamental cichlids are easy to keep in the aquaria. The food habits and temperament of each type must be learnt before putting it in a community aquarium. 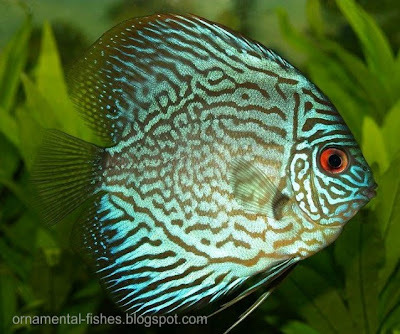 Some of these ornamental fish are docile and live peacefully with other fish. However many fish are aggressive and carnivorous. These ornamental fish should be kept in isolation or with their own species. The water must be clean and of good quality. Aeration and filtration are necessary. As many of cichlidae grow to bigger size, the size of the tank must be suitable and roomy for them when they grow up. Some tend to dig up the bottom or make it messy. There is great diversity in the feeding habits of these Cichlidae fish. Many of the Cichlidae are herbivorous feeding on the submerged plants and algae. They may also take insect larvae and small invertebrates. Some of the cichlids are bottom feeders feeding on the bottom detritus. Some cichlidae are carnivorous feeding on smaller fish, insects and worms. If the ornamental cichlidae are of carnivorous type suitable feed like live worms and fish, freeze dried worms and formulated feed with high protein concentration must be given. Most of the cichlids show parental care. Some cichlidae like angelfish attach their eggs onto a substratum and the male angelfish after fertilising them keeps guarding the eggs and fanning fresh flow of water on to the eggs. 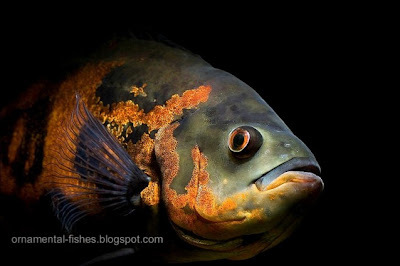 Some of these ornamental fish species lay their eggs on the substratum and them pick them up into the mouth to brood. The eggs hatch and baby fish seek refuge in the parent's mouth when alarmed. In some ornamental cichlidae males are mouth brooders whereas in some species females carry the eggs in their mouth. Some cichlids carry the eggs till they hatch whereas some carry the hatchlings also, till they are several weeks old.